The process whereby early exposure to an adverse environment has an influence on later life outcomes has been called ‘early life programming’. While epidemiological evidence for this has been available for decades, only in recent years have the mechanisms, in particular epigenetic modifications, for this process begun to be elucidated. We discuss the evidence for early life programming, the possible mechanisms, how effects may be transmitted across generations, and conclude by looking at some examples relevant to general paediatrics. The fact that early exposures might have an influence on health outcomes later in life has been recognised since the first half of the 20th century. In 1933 Kermack et al1 analysed historic death rates data for England, Scotland and Sweden and noted that “the figures behave as if the expectation of life was determined by the conditions which existed during the child’s earlier years”. They further speculated that “improvement in infantile mortality is dependent in large measure on improvement in maternal health”. In 1977 Forsdahl2 correlated higher infant mortality in Norway with a later increased risk of death from cardiovascular causes. He proposed poverty in childhood and adolescence followed by prosperity as a risk factor for cardiovascular disease (CVD), and hypothesised that “some form of permanent damage caused by a nutritional deficit” might be involved. Ongoing epidemiological work continued to show an association between low birth weight and a higher risk of CVD, stroke, the metabolic syndrome and osteoporosis in later life. 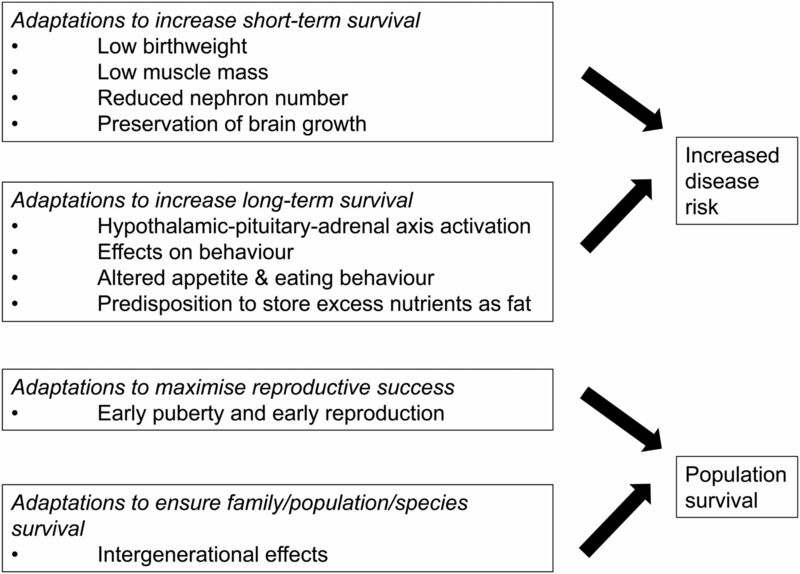 Barker and colleagues,3 in a series of papers argued that a fetus faced with undernutrition slows its growth rate to reduce its nutritional requirements, but this period of undernutrition might also lead to reduced function in key organs, altered metabolic and endocrine feedback loops, and an increased vulnerability to adverse environmental stressors. Over time these ideas have developed into the Developmental Origins of Health and Disease concept, whereby early life exposures are thought to lead to ‘programming’ of cardiovascular, neuroendocrine and metabolic systems, predisposing the individual to later life non-communicable diseases (NCDs). Some authors have put this concept of programming within an evolutionary paradigm with the idea of the ‘predictive adaptive response’.4 They argue that these stereotyped responses to an adverse early life environment are adaptive in the short term, and particularly when individuals continue to live in a resource-poor environment, represent the best way to guarantee they reach reproductive age themselves. 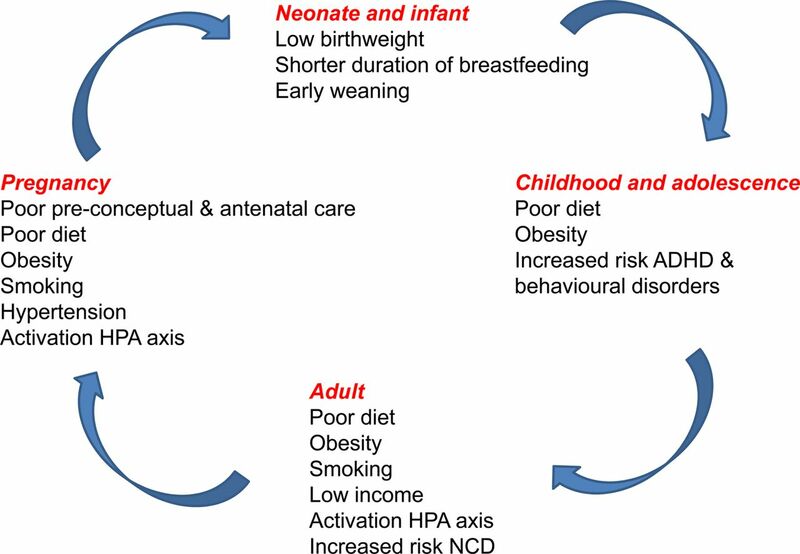 However, in a resource-rich postnatal environment such as that of the developed world, these programmed changes might have the (unanticipated) effect of predisposing affected individuals to an increased risk of NCDs in adulthood (figure 1). Regardless of the validity of the idea of a ‘predictive adaptive response’, in recent years focus has shifted from extremes of birth weight to how programming might occur across all pregnancies and in individuals with birth weights within the normal range. Early life programming and later disease risk. Exposure to an adverse early life environment results in changes which may maximise short-term and long-term survival but which can result in an increased risk of disease in later life. Such programmed effects may also include strategies to maximise reproductive success and population/species survival. Prenatal glucocorticoid overexposure is also associated with programmed effects. Epidemiological studies show that pregnant mothers exposed to a significant life event (death of a loved one, exposure to terrorism or a natural disaster) give birth to infants with a lower birth weight,18 who have an increased risk of impaired cognition.19 Maternal stress is also associated with effects on neurodevelopment in neonates, manifesting as lower scores on neonatal assessment,20 behavioural and emotional problems at the age of 4 years,21 decreased grey matter density,22 and lower cognitive and language abilities in childhood.19 The children of mothers treated with glucocorticoids because of a risk that the unborn child has congenital adrenal hyperplasia appear to be at risk of worse cognitive function than controls.23 Studies in rodent, sheep and non-human primate models show an association between antenatal glucocorticoid exposure (exogenous and endogenous), raised blood pressure (BP) and altered glucose-insulin homoeostasis, neuroendocrine function and behaviour.24 Finally, a variety of other adverse environmental factors have been shown to impact on neurodevelopmental outcomes: maternal infection, alcohol consumption, recreational drug use, treatment with certain medications (eg, sodium valproate) and prenatal exposure to toxins such as arsenic and lead have all been associated with an increased risk of adverse neurodevelopmental outcomes including schizophrenia and autism (reviewed in ref. 25). Because of phenotypical similarities between adults born SGA and prematurely, some researchers have postulated that while in low birthweight infants the adverse environment is experienced in utero, in preterm infants these environmental challenges occur postnatally.32 Preterm birth, regardless of birth weight relative to gestation (ie, without evidence of in utero growth restriction), has in itself has been associated with a reduction in insulin sensitivity,32 ,33 changes in the endocrine regulation of childhood growth34 and increased adiposity.35 Similar to SGA infants, rapid early weight gain may also be detrimental for preterm babies: in a randomised controlled trial which allocated preterm infants to high or lower nutrient diets, those with the most rapid weight gain in the first 2 weeks of life showed evidence of insulin resistance in adolescence36 and other studies report that upward centile crossing for weight in infancy37 and childhood38 are associated with insulin resistance and higher BP. A consistent criticism of the Developmental Origins of Health and Disease concept has been the difficulty in disentangling the putative effects of programming from the shared genetic and environmental influences affecting offspring. Nevertheless, studies in humans and in animal models have attempted to address a number of potential mechanisms. Programming may also lead to longer-term hormonal changes. In rodents, prenatal glucocorticoid excess affects the renin-angiotensin-aldosterone system and undernutrition and glucocorticoid overexposure affect glucose-insulin homoeostasis in a variety of animal models.24 Maternal obesity/overnutrition during pregnancy leads to programmed alterations in the brain, in particular the hypothalamus, which may impact on appetite control.15 Importantly, nutrient deficiencies, low birth weight and maternal stress affect hypothalamic-pituitary-adrenal (HPA) axis development45 and this may be a key mechanism linking the early life environment with later disease risk. Exposure to an adverse in utero environment is associated with altered HPA axis activity in childhood and adulthood46 ,47 which may relate to the higher risk of neurodevelopmental problems,48 and changes in HPA axis activity are also a risk factor for CVD in later life.46 Finally, resetting of the HPA axis affects the development of key glucocorticoid responsive organs such as the kidneys, adipose tissue and pancreas,45 linking structural and hormonal changes in the programming of later life disease. There has been much interest in recent years in the role of epigenetic modifications in early life programming. Epigenetic modifications lead to changes in gene expression that are not explained by changes in DNA sequence, and during normal development, key developmental stages are characterised by epigenetic modifications that have the potential to be altered/disrupted by environmental cues. Epigenetic modifications include DNA methylation, histone marks and small, non-coding RNAs. Nevertheless, although studies have shown epigenetic changes in association with early life exposures, the degree to which such changes are adaptive within the life course, occur as a consequence of the induced disease state or represent a pathophysiological response to adverse exposures remains to be determined as the mechanism(s) of these changes are elucidated. Recent studies suggesting that a significant proportion of neonatal DNA methylation changes are determined by genotype rather than environment,59 highlight the difficulties in distinguishing genetic from epigenetic inheritance. Potential mechanisms accounting for the transgenerational transmission of disease risk. (A) Persistence of an adverse environment leads to the reinduction of programmed effects in each subsequent generation. (B) Maternal effects: the induction of programmed effects in the F1 offspring following in utero exposure lead to the induction of programmed effects on the developing F2 fetus and so on. 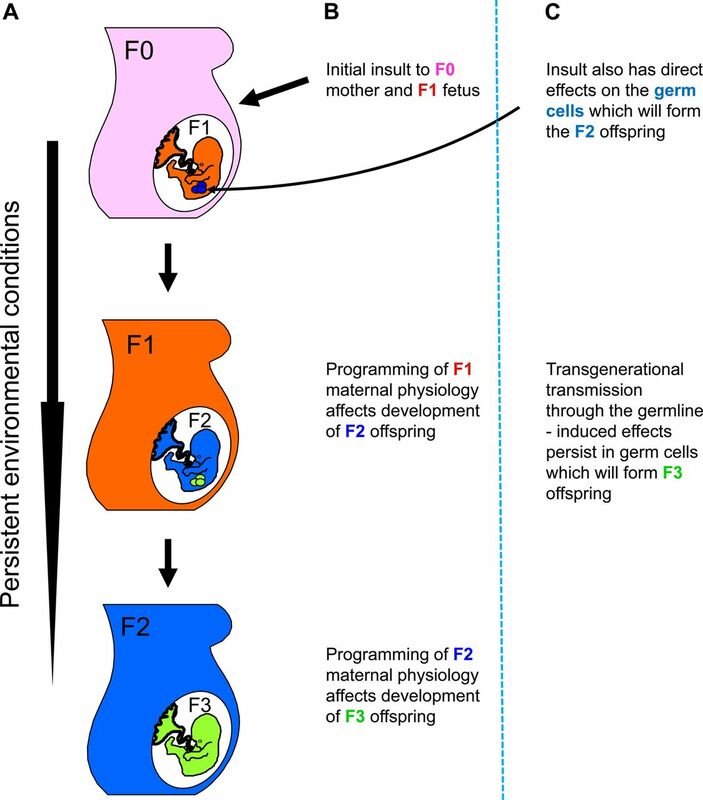 (C) Exposure to an adverse environment affects the developing F1 fetus and has direct effects on the germ cells which will form the F2 generation and these changes are maintained in the germ cells for a number of subsequent generations. An understanding of early life programming and its consequences is of clear importance for paediatricians who are ideally placed to identify those most at risk of later disease and to facilitate the development and implementation of interventions. Given that adverse early life environments may affect children's later life outcomes, and that of their own offspring, a paediatrician's role takes on important public health aspects. First, we can influence care from the beginning of life by emphasising the importance of good maternal health and antenatal care in optimising child and adult health. Addressing modifiable risk factors, including maternal obesity, excess gestational weight gain, maternal smoking and vitamin D levels and breastfeeding duration10 could make a significant contribution to child health, and by implication, improve adult health. Indeed, paediatricians have been involved in the development of the National Institute for Health and Care Excellence evidence-based guidelines for the antenatal and postnatal care of women and babies (http://www.nice.org.uk) and these have been endorsed by the Royal College of Paediatrics and Child Health. Since programming effects may also occur as a consequence of experiences in infancy and childhood, targeted interventions during infancy and childhood may improve later health. For example a randomised controlled trial of the effects of additional support for single, poor, deprived mothers during pregnancy and first 2 years of life resulted in improved educational performance in childhood, less substance abuse at 12 years and less criminal behaviour at 19 years in their offspring.71 Importantly, evidence suggests that such interventions also have the potential to improve health outcomes across generations.65 ,66 Paediatricians could have a key role in identifying the factors which lead to the perpetuation of effects and in designing and implementing interventions to interrupt these intergenerational cycles60 (figure 3). Intergenerational cycle of disease risk. Early life programming may result in effects which persist across generations. Paediatricians are well placed to identify those at risk and to develop and implement interventions at many points during the life-cycle. ADHD, attention deficit hyperactivity disorder; HPA axis, hypothalamic-pituitary-adrenal axis; NCD, non-communicable disease. In conclusion, paediatricians are ideally placed to undertake research leading to an increased understanding of the mechanisms underpinning early life programming, to develop strategies for the early identification of disease risk and finally, to design and implement therapeutic strategies, with consequences that may improve health for the children we care for, and for future generations.
. Are poor living conditions in childhood and adolescence an important risk factor for arteriosclerotic heart disease? Br J Prev Soc Med 1977;31:91–5.
. Environmental alterations of epigenetics prior to the birth. In: Subhash CP. ed. International review of neurobiology. Academic Press, 2014:1–49.
. Glucocorticoids impair fetal beta-cell development in rats. Am J Physiol Endocrinol Metab 2001;281:E592–9.
. Altered control of cortisol secretion in adult men with low birth weight and cardiovascular risk factors. J Clin Endocrinol Metab 2001;86:245–50.
. Development of type 2 diabetes following intrauterine growth retardation in rats is associated with progressive epigenetic silencing of Pdx1. J Clin Invest 2008;118:2316–24.